CNN, Times of India, BBC, The Hindu... many journalists all over the world talked about us. Please, check their articles on the following list. Title: "Young ears are seasoned by what they hear"
Synopsis: What you listen to actually becomes the guide of our soul' says Shekhar Ravijiani. Read out what this renowned music composer has to say about the singers of today. Title: Book tickets here "Hazaaron Khwahishein Aisi"
Title: 30th anniversary with "Hazaaron Khwahishein Aisi"
Synopsis: Salaam Baalak Trust, an NGO working with street children, is commemorating its 30th anniversary with "Hazaaron Khwahishein Aisi", a tribute to late 'ghazal king' Jagjit Singh performed by singer-composer Shekhar Ravjiani featuring renowned instrumentalist Deepak Pandit. Source & Links: Business Standard. 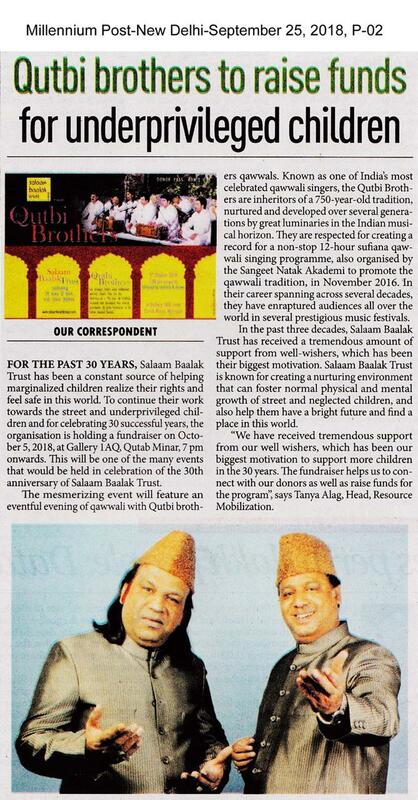 Synopsis: Salaam Baalak Trust is celebrating 30 years of work with street children by sparkling the evening with soulful Qawwali by the famous Qutbi Brothers followed by cocktails and dinner. Source & Links: allevents.in, Townscript, Business World, DelhiEvents.com, dailyhunt, millenniumpost, Events High and pressreader. Synopsis: The mesmerizing event will feature an eventful evening of qawwali with Qutbi brothers qawwals. Synopsis: Let's look at Salaam Baalak Trust's city walk through Ambica Gulati's lens. She has an amazing story to share with us. Synopsis: Street kids are the most neglected children in India..
Synopsis: Fall in love with Delhi's past and present through a curated visit to its historic sites, pristine organic farm villas on the outskirts. Title: Don't give money to the children on the streets of India. Here's what you can do instead. Synopsis: WHEN YOU TRAVEL TO INDIA, it is inevitable that you be approached by begging children on the streets. Synopsis: CQUniversity Vice-Chancellor Professor Scott Bowman has awarded Salaam Baalak Trust founder Ms Praveen Nair with an Honorary Doctor in Social Innovation during his recent visit to India. Synopsis: Come join us under the Banyan Tree at Gallery 1AQ for an evening of Dastangoi by Sunil Mehra & Askari Naqvi presenting An Ismat Chugtai Double Bill, in aid of Salaam Balaak Trust! Synopsis: Renowned comedian and master improviser Papa CJ performed in front of a packed crowd at Ojas Art Gallery on 4th December for Salaam Baalak Trust, to raise funds for a cause. Synopsis: Acclaimed Indian filmmaker Mira Nair will be holding an exclusive preview of her forthcoming film 'Queen Of Katwe' here for her Salaam Baalak Trust, to raise funds for a cause. 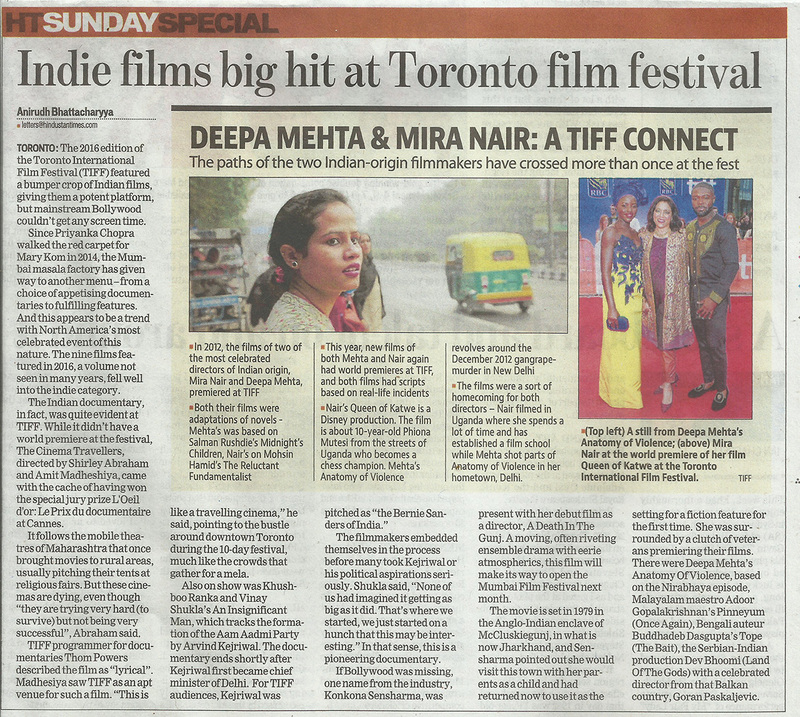 Synopsis: The 2016 edition of the Toronto International Film Festival (TIFF) featured a bumper crop of Indian films, giving them a potent platform, but mainstream Bollywood couldn't get any screen time. Synopsis: 12 children who had never seen the inside of an aircraft experienced their first ever air journey on Vistara's maiden flight from Delhi to Mumbai. The residents of the shelters run by the Salaam Baalak Trust across NCR. Synopsis: Bindiya, 13, along with four other children, leaves her home in slum cluster in Narela at 7 am sharp every day. They return home by around 5 pm. Their routine may be mistaken for school timings. But these children head to Connaught Place to sell pens to make a living. Synopsis: In a first of its kind event, the human resource development minister Prakash Javadekar felicitated 46 students who achieved high in their XII exams, despite hailing from economically weakest of weaker sections. Synopsis: Prince William and his wife Kate Middleton visited a facility run by the Salaam Baalak Trust, which supports working children in the national capital. Synopsis: The Turkish ambassador's residence in the city was recently seen immersed in sufi tradition. The evening, in association with Salaam Balaak Trust, saw soulful renditions of sufi urdu hindavi and pharsi poetry by Rene Singh, accompanied with musical compositions and expressions of dance by Shivani Varma. Synopsis: Salaam Baalak Trust (SBT), which works with children in Delhi has been got an international award, the National Arts and Humanities Youth Program Awards for 2014 given out by the US government. The award carries a $10,000 grant and support in communications and capacity building for a year. Synopsis: The challenge Constant power cuts meant that after-school study hours weren't easy. The Light Bag project was born. The light bags were distributed to several open schools run by The Salaam Baalak Trust in slums across Delhi. Synopsis: Gurgaon recently welcomed the students and performers of Salaam Baalak Trust to celebrate 25 years of their existence. Title: Poverty tours: A learning experience or simply gawking? Synopsis: In New Delhi, Nigel Richardson joins an ex-runaway for a unique look at the life of the city's homeless children. Synopsis: In New Delhi, a mega fundraising charity dinner and concert were organized for the street children. Synopsis: The story of Shekhar Sahni, the 21-year-old grew up on India's rough streets and dreams of becoming a Bollywood star. Synopsis: Australia is supporting the work of Salaam Baalak through the Australian High Commission New Delhi's Direct Aid program, with a grant of up to 10 lakh rupees ($30,000). Synopsis: Salaam Baalak Trust (SBT) is an Indian non-profit and non-governmental organization which provides support for street and working children in the inner cities of New Delhi, and Mumbai. Synopsis: Dark, dank alleys wind round the New Delhi railway station. Chaos everywhere as cars, cycle rickshaws, handcarts and buses aim for the same lane all at once. Synopsis: This is a city walk unlike any other... street children of Delhi offer glimpses into their way of living and surviving. Synopsis: Filmmaker Mira Nair with street children at the inauguration of a unique international photo exhibition in New Delhi.